Danny Meyer has a lot of fans at the New York Public Library. His book, Setting the table: the transforming power of hospitality in business, has been read by more than a few librarians who subscribe to his belief in hospitality and customer service. It's a wonderful and inspiring book, and should be required reading for anyone in the service industry. Oh, yeah, his food ain't bad either. Now, I'm not a Danny Meyer restaurant aficionado. I've been to Union Square Cafe once (not surprisingly with a group of librarians, and it was delicious), and I don't bother with Shake Shack unless it's slightly drizzling, and then I'm only too happy to dry off a table and chair in order to have a moment with my Shack Burger. 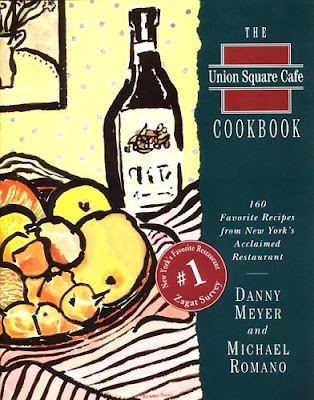 But this weekend I decided to try and actually cook from his Union Square Cafe Cookbook. I knew the bar nuts recipe (perfect for Superbowl Sunday), but beyond that, I was a complete novice. Considering the weather (cold) and my Sunday social obligations (umm, none), I opted for the black bean soup which requires a mere four hours of cooking time in the oven, not to mention an overnight soak for the beans. Well, it was worth the wait. The smell that enveloped my apartment from the beans, bacon, and vegetables was, I hope, jealously inducing for my neighbors. It was that long, slow, cooking smell that reaches into the apartment building hallways -- smells that make you go mmm. I counted down those last few minutes, pureed the soup, added more salt, a splash of sherry vinegar, and slurped it up. Danny Meyer has fans, indeed. Soak the beans overnight, or for a minimum of six hours. Preheat the oven to 300 degrees F. Rinse the beans well and place them in a pot with water to cover. Bring to a boil, then drain the beans, discarding the water. Place the beans in a 4 qt. ovenproof pot with the carrots, celery, onion, garlic, thyme, and bacon. Cover with 2 qt. water and add the salt and pepper. Bring to a boil on the stove, then cover tightly, and place in the oven to cook for four hours. Puree the contents of the pot. Adjust seasoning to taste. To serve, dip one side of each lemon slice in the minced parsley and float, parsley side up, on each portion of the soup. Add a 1/4 ounce shot of dry sherry to each bowl just before serving, if desired.